Gum Fighters pressure washing services are performed by highly trained staff using only commercial grade cleaning equipment. We offer the benefit of both hot and cold water pressure cleaning applications using industrial surface cleaners, pressure-controlled wands and biodegradable cleaning detergents. All of our work is scheduled and performed during hours that least disrupts the daily operations of your property. Our commercial pressure washings services are available to property managers, facility managers, strata complexes, co-op buildings, restaurants, hotels, business owners, and municipal and government facilities. 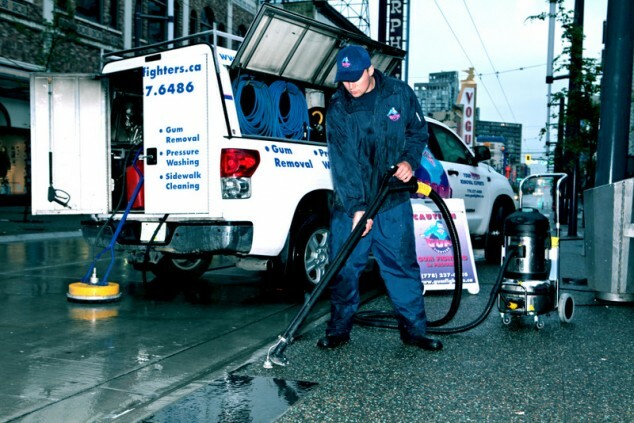 Gum Fighters provides commercial pressure washing services to the cities of Vancouver, North Vancouver, West Vancouver, Burnaby, Richmond, Delta, New Westminster, Coquitlam, Port Moody, Surrey, Langley, Pitt Meadows, Maple Ridge and Abbotsford.